“The Prize”, an award-winning history of oil written by Daniel Yergin, covers the growth of the oil industry around the world, beginning with the start of the industry in the United States. But right behind those early chapters comes the story of Russian oil. This is not surprising since between 1898 and 1901, Russia and America roughly split global production of around 500,000 bd between them, with Russia out-producing the United States on occasion (as it does again now). That Russian oil is Russian no longer, since the early oilfields were found on and off the Aspheron Peninsula in what is now Azerbaijan (annexed by Russia initially in 1813 by Alexander I). The first well was drilled in 1847, after decades of recovering the oil from hand-dug pits, with ongoing activity there ever since. By 1904 the Baku region was producing 73 million barrels a year, although production began to decline after that. And with the loss of much of its male population during the revolution, it took a long time to recover. Yet it had rebounded to be strong enough that this oil from the Baku reservoirs was considered a critical factor in governing many battles of the Eastern Front in the Second World War. 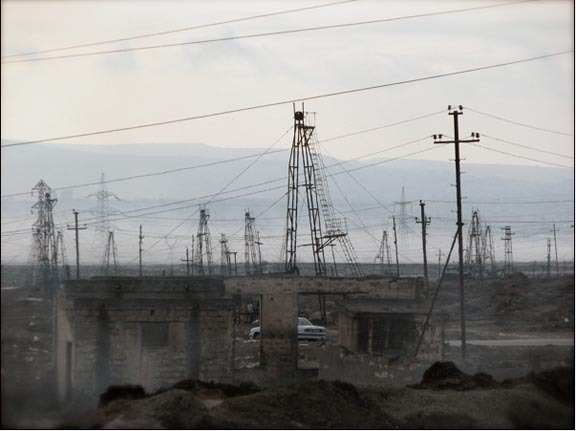 Azerbaijan sits in a region of states along the southern Russian border that show the promise of holding some of the last large deposits of fossil fuel yet to be fully developed. The first fields to be developed were the onshore Balakhany, Sabunchi and Ramany in 1871, with the coastal field of Bibi-Eybat being developed in 1873. Such was the nature of prospecting at the time, and the multiplicity of oil-bearing layers in the ground, this oil still remains to be found and recovered. It has been estimated that the fields initially held around 8 billion barrels of oil (John Grace), but while a billion of this was within range of early technology, the rest waited for the more advanced western technologies to arrive, though sometimes these didn’t. As a result, new wells have been sunk in these old fields within the last year. One at Balakhany is aimed to be 3,200 ft deep, with a target production of 28 barrels a day. Most of the production followed the Russian Civil War and in the lead into World War II. In 1913 production was at 206 kbd but fell to 81 kbd by 1921, and then slowly built until the region was producing 622 kbd by the start of the war. The older fields no longer have the reserves to justify the investment of the large capital equipment associated with modern technology, but their history describes the wealth that they produced before the World War I, first for the Nobel family and then for the Rothschilds. Baku oil also underwrote the career of Mr “Five Percent” Calouste Gulbenkian. Daniel Yergin notes that it was the need to replace expensive British coal that led Russia to use oil, first in ship bunkers on the Black Sea and then to fuel the railway engines across Russia. However, production continued to fall from the original wells at Baku; Royal Dutch/Shell had bought out the Rothschilds, yet in the period just before WWI, Russia’s export market share had dropped below 10% as the shallow fields ran out. Of course this was also the time that Stalin was learning his trade as an organizer/agitator in the Baku fields, though it was not until 1920 that the Bolsheviks took Baku and nationalized the oil industry. Azerbaijan remains, however, along with the fields off the peninsula, the source of a growing percentage of global production. Because of that, this is where the Baku-Tiblisi-Ceyhan pipeline begins. The BTC pipeline carries up to 1.2 mbd of oil to the Turkish port of Ceyhan on the Mediterranean where it can be loaded into tankers. To meet this and other demands, the re-growth of the oil industry in Azerbaijan has, within the last decade, raised production from 283 kbd to more than 1 million bd. The most productive of these fields lies 62 miles east of Baku in the Caspian, where the complex of fields known as the Azeri-Chirag-Gunashli (ACG) field lies. The complex is believed to hold 9 billion barrels of oil, though these are only a few of the fields found in the region. Yet there is a world of difference between how these fields are being developed with modern equipment and investment and the fate of the older fields. It is here also that the Shah Deniz field, with 22 Tcm of natural gas and 750 mb of oil can be found. The region has thus not only had but continues to have significant fossil fuel reserves. Production this year averaged 989 kbd to date, with $19 billion in exports of 715 kbd. This is up from last year, but down from the 2009 figures. 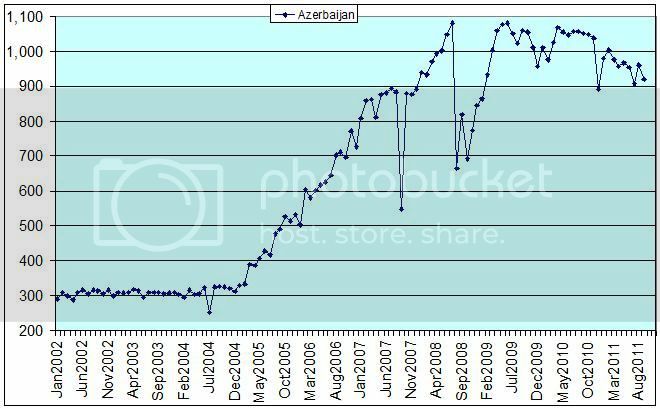 As the volume of oil available has increased, so the market for Azeri oil has also grown. Azerbaijan began exporting oil to India this year, and already sends some to China. It plans on sending oil to Czech and Ukrainian refineries and to Slovakia to the tune of around 15 million barrels a year. 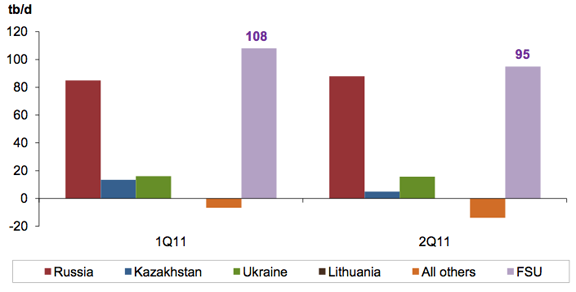 The diversion of more oil to countries of the Former Soviet Union is something that has caught OPEC attention, and they note in their November MOMR that the booming Russian economy is increasing internal demand, with a consequent cost to exports to the tune of around 100 kbd growth in demand in the FSU to 4.2 mbd. In terms of natural gas production, the IEA projects that this will grow from a current 17 billion cubic meters (bcm) a year to 50 bcm by 2035, much of this to come from the second phase of the development of Shah Deniz. In this regard it should be remembered that there are three main oil pipelines that carry oil out of Azerbaijan and while the BTC carries the majority, the Baku-Novorossiysk pipeline (B-N) carries 7% of the exports to the Black Sea Russian port of Novorossiysk, and the Baku-Supsa pipeline carries 14% of the total feeding oil to the Georgian port of Supsa, with a capacity of 145 kbd. 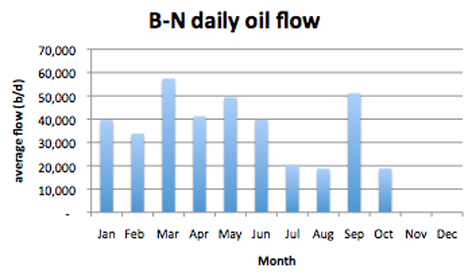 The flows from Azerbaijan to Russia, via the B-N pipeline have been fluctuating all year, but on average have fallen over 12% from last year. It may be that, in the same way Russia used to play with demand for gas from Turkmenistan, they are now playing the same game of cutting back demand in order to force lower prices. However, as with the Chinese pipeline to Turkmenistan, the BTC pipeline from Baku provides other customers so that prices may now be maintained – and with these, support for the local governments. (The Azerbaijan government now has a strategic reserve of $41 billion). Folks, at lot (some?) of us have such slow Internet connections that links to You Tube or any other video is useless. If it is short, I can "pre-download" by putting it on pause and watch it without a break several times a "minute". Otherwise, I skip them unless there is a transcript. FireFox has an add on called "Ant Video Downloader". Most flash movies (like youtube) can be saved to hard disk and viewed later. It works on pretty much everything except publishers are who work hard to keep copyright (i.e. ComedyCentral). Try it. It looks like Azerbaijan's best production days are behind her. Of course they could always turn things around but Megaprojects doesn't have much coming on line either. 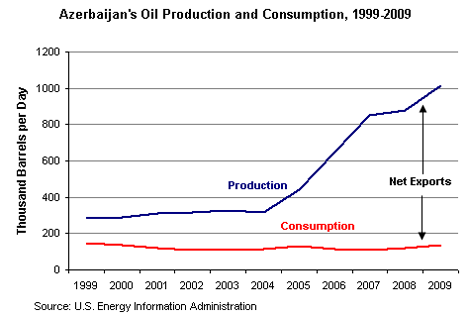 Azerbaijan Production in thousands of barrels per day according to JODI. Last data point is September 2011. The huge dive in production in 2008 is due to a blowout in a gas injection well. A later cable says BP concluded that “a bad cement job” caused the leak. If true (and we do not know that it is), at minimum it indicates a systemic problem of bad cement jobs on its oil rigs. No new megaprojects and a target production of 28 barrels a day certainly looks like the best production behind. If I remember correctly average in US is 10 barrels per day and these 28 barrels is for a new well that will decline even if production target is reached. It's all down to the economics and risk. Risk is low since its in a known field. Cost is low since it is onshore. You can probably drill this for less than $2m, so it would pay for itself in 2-3 years. Ron - I'm pretty sure you're aware: "...at minimum it indicates a systemic problem of bad cement jobs on its oil rigs." Indicates...at a minimum? As I mentioned several times back during the Macondo nightmare bad cement jobs are not just systemic...they are all but guaranteed. Cement fails so often the equipment to fix bad cement is kept on rigs 24/7. That's why there are not only standard practices to test the cement but also standard safety practices to deal with such potential failures. And from the details I saw BP did not follow either set of safe practices adequately. A tad off topic but it irritates me towards no end when it’s implied that an operator may have gotten caught off guard when a bad cement job causes a catastrophe. The first assumption you make when you pump a cmt job is that there’s a fair chance it won’t hold. So you act accordingly. Rockman, the link I posted had its origins with wikileaks. Back when it was happening I saw a few links stating the problem was caused by a gas leak. I assumed it was a sour gas leak so that was why it took so long. Now this link says it was a blowout from a gas injection well. True that is also a "gas leak" but not exactly the same thing. Why can't they just tell us what the problem was? Why the secrecy? The one month downward spike back in September of 2007 was also supposed to be caused by a gas leak but who knows? The gas leak was a sub sea blowout, ie the gas escaped from the seabed and engulfed the rig. I don't believe it was sour gas. I was told the story from someone who was there, but the details escape me at the moment. The problem well was either the first or second on the platform. If you are interested, I will make inquiries when I return to work as we have a few ex-Baku hands where I am and get the inside scoop, and post in a few weeks. But you must remember, my story might differ from the official report, lol. Toolpush, sorry to be so late in replying but I have been out of pocket for the last 24 hours. Wife in the hospital and I was there with her. Anyway, of course I would like to know but it is really not that important. They had a gas problem that caused several platforms to be off line for several months. That is about it. During the 90's I had a subscription to Azerbaijan International. It was lush, slick and heavy on local culture - apparently supported by oil company advertisements. I haven't seen it in recent years. has anyone (layman, not in on the petroleum biz) ever had any luck visiting oil fields/refineries and talking to people working there? This could be anywhere in the world - Canada, Russia, North Sea, Southeast Asia, Egypt, or Azerbaijan for that matter. I ask because I am writing an application for a year-long university travel fellowship and I want to know if it is possible for me to fulfill this "unusual" curiosity about the oil business. B - Gail has had some experience getting "on the other side of the fence". She might give your some ideas how to play the public relations folks for access. Otherwise it can be difficult. Not that anyone is tryng to hide anything but it's an insurance issue. For instance when I drill a well I have general coverage insurance. I can authorize anyone I want to be on my location. But doing so makes me responsible for anything that happens to them or anything they cause to happen. If they have no experience/training/certification it will likely void my coverage. About 30 years ago I took a group of secretaries on a field trip to a drilling well. Kept them away from the equipment, of course. Afterwards one of my coworkers asked how I got permission...his request had been rejected. Easy, I told him: I wasn't dumb enough to ask permission. (Yes...I was young and very full of myself). And today companies are much more safety conscious today. BTW: some of the ladies were more impressed when the saw raw cotton for the first time. The farmers had just pulled their cotton from the fields and it was scattered along the roads. Another approach is to make friends with the landowner that have operations being conducted on their property. I'll usually let a mineral owner on a drill site and give them a show & tell...always careful to keep them away from the equipment. Just had a flash: contact folks with the petroleum engineering department at Texas A&M. They have contacts with the oil patch that periodicly gets thm access. You might even try Halliburton and Schlumberger. But you need to word the request in a oil patch friendly way. Your university might be able to add some credibility to your request. And if you make it to the Houston area and I have a well drilling I'll be glad to haul you out there. That was very interesting information Rockman, thanks much! I'll take you up on the Houston show and tell if I ever get out around there. Rockman - I saw you mentioned A&M in your post and seems like you have some history in the industry. I'm applying to UT for Petro/Geosciences. I'm sure I'll have plenty of opportunities to say which is better in the future. But I'm hoping to get hands on time ASAP in combination with my class time. I think the sooner I get my feet wet the better I can understand and apply myself. Not looking for hand me outs, just anything that didn't or did work for you in the past? Any gems of wisdom would be appreciated. Request For Information On State Oil Company Of Azerbaijan (SOCAR) Origin Secretary of State - Worth a read. Observers in Baku often note that today's Azerbaijan is run in a manner similar to the feudalism found in Europe during the Middle Ages: a handful of well-connected families control certain geographic areas, as well as certain sectors of the economy. By and large, this seems to be the case, with general agreement among leading families to divide the spoils and not disturb one another's areas of business or geographic control. The families also collude, using government mechanisms, to keep out foreign competitors, and entities such as the State Border Services, State Customs and tax authorities create barriers that only the best connected can clear. As a result, an economy already burgeoning with oil and gas revenues produces enormous opportunity and wealth for a small handful of players that form Azerbaijan's elite. This series of reports will describe the businesses they run, the regions they control, and the ministries they keep under their thumbs. 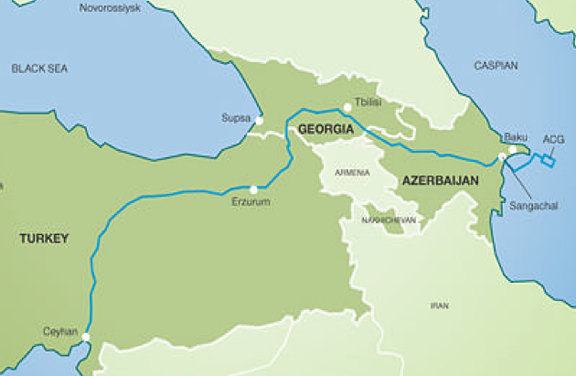 Azerbaijan: A Modest Pipeline Proposal? And thought the first oilwell was the one in Sarnia! I spent a week in Azerbaijan back in 2008, working on a producted water treatment project for BP. The Sangachal Terminal is impressive, with a large throughput produced water treatment facility that was under construction at that time. 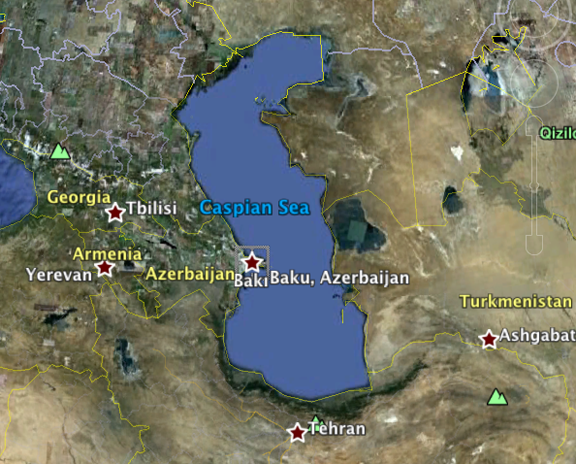 I enjoyed Steve LeVine's 2007 book "The Oil and The Glory: The Pursuit of Empire and Fortune on the Caspian Sea". It provides a good description of the labyrinthine negotiations that took place between the USSR, its successor nations, and Western oil companies during a time of much geopolitcal change. 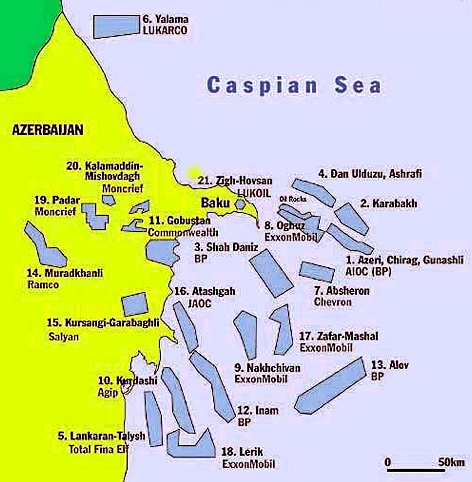 Azerbaijan also have "Oil Rocks", or Neft Daşları, the fantstic city in the sea. An impressive place. Do they take tourists?